Tonsillolith is medical lingo for tonsil stones, which are an often-unfamiliar cause of bad breath. You’ve likely heard of kidney stones; they form when calcium salts and other substances crystalize and develop in your kidneys and urinary tract. But kidneys are not the only place that can develop stones. Tonsil stones will look like tiny yellowish or white balls that also resemble a piece of food, and are found in tonsil crypts, crevasses, and tunnels. As a result, they can produce rotten-egg smell from bacteria buildup. Although it is a hidden cause of bad breath, tonsil stones are considered a non-serious and treatable condition. It is estimated that 30,000 Americans suffer from chronic tonsil stones. First of all, what do your tonsils do? Many people may remember getting their tonsils removed during childhood. Research now suggests that getting your tonsils removed won’t necessarily protect you from viral or bacterial infections. In fact, your tonsils are part of the lymphatic system, which is designed to help fight infection and protect you against bacteria, mold, viruses, and other debris. What causes tonsil stones exactly? There are several factors that contribute to their formation. Like kidney stones, tonsil stones form from the accumulation of calcium and other substances like magnesium, phosphorus, bacteria, dead cells, mucus, and food. These substances will grow to varying levels of hardness, but they will usually only enlarge to the size of a pencil eraser. Studies have also linked tonsil stones with post-nasal drip, which is another cause of bad breath. Tonsil stones will rarely affect a person’s breathing. That said, if you’re having breathing problems, your doctor may surgically remove the stones through a procedure called a tonsillectomy. But, since your tonsils are important for health, the surgery is rarely recommended. Bad breath: As mentioned, bad breath is a key sign of tonsil stones. You may also have a metallic taste in the mouth. Gum disease, tooth decay, and a poor diet are some of the more common causes of bad breath, but researchers suggest that tonsil stones should be considered when the cause of bad breath is unknown. White debris: Sometimes a solid white lump can be seen at the back of the throat; while other times the white debris is hidden within the folds of the tonsils. Sore throat and problems swallowing: Tonsil stones may cause pain in the area of the throat where they are stuck, and may lead to coughing. 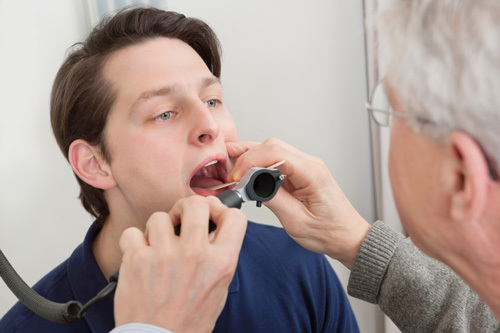 The person may also have a problem swallowing liquids or foods depending on the size or location of the tonsil stones. Swelling: Tonsil stones may swell or become larger when inflammation from an infection is present. Ear pain: Tonsil stones may lead to ear pain since the tonsils share nerve pathways with the ears. If you have tonsil stones but aren’t presenting with any uncomfortable symptoms, special treatment is likely not necessary. But if you’re experiencing bad breath or other tonsil stones symptoms, then it may be a good idea to remove them. Some people remove the stones themselves with a cotton swab or a toothpick. Others opt for minor surgery to remove the stones. Some people find antibiotics useful for tonsil stones, but that treatment fails to correct the cause of the problem. Also, tonsil stones are likely not a good enough reason to take antibiotics anyway, as antibiotics can have a number of side effects and may lead to antibiotic resistance to certain bacteria. Instead, here are some natural ways to remove tonsil stones. Gargling with salt water: By gargling salt water you may ease throat pain and help dislodge your tonsil stones. Simply dissolve half a teaspoon of sea salt in an eight-ounce glass of warm water, and then gargle it. Himalayan pink salt or Celtic grey salt are the best varieties of sea salt to use. Homemade mouthwash: Make a rosemary and peppermint tea, and let it cool off. This makes for a very effective mouthwash against bad breath and tonsil stones. Both herbal remedies contain antimicrobial properties that help fight infections. Onions and garlic: The potent antibacterial properties of onions and garlic will help remove and prevent tonsil stones and other infections. Chew on garlic and eat raw onions in salads daily. Lemon juice: Lemons, lemon oil and lemon juice contains strong antiviral and antibacterial properties. The vitamin C, magnesium, and bioflavonoids in lemons help fight infection, boost the immune system, and effectively remove tonsil stones. To treat your tonsil stones simply mix a couple of tablespoons of fresh lemon juice in a glass of filtered water. Essential oils: Essential oils are also a good way to treat tonsil stones. Many essential oils contain antibacterial and anti-inflammatory properties. These essential oils include myrrh, lemongrass, peppermint, eucalyptus, and Thieves oil. To use these oils for tonsil stones, simply add a few drops to your toothbrush, and brush daily. You could also spray the essential oils on the affected area. Apple cider vinegar: Apple cider vinegar contains antibacterial, anti-fungal, antiviral, and antiseptic properties that are perfect for tonsil stone removal. You should dilute the apple cider vinegar in a little bit of water, and then gargle the home remedy. It’s important to keep in mind that while tonsil stone removal is possible, it’s also a good idea to prevent the development or recurrence of tonsil stones in the first place. Here are some effective ways to prevent tonsil stones. Brush your teeth and gargle: It’s a good idea to brush your teeth and floss after every meal and at night. This will ensure that food particles don’t get trapped in your teeth. After brushing, drink some water to flush any other excess food down the throat. Avoid artificial oral health products: Many toothpastes and mouthwashes are loaded with chemicals and artificial sweeteners. Luckily, natural products are at many health food or drug stores. Another option is to make your own toothpaste with hydrogen peroxide and baking soda. Homemade mouthwashes can also be made with essential oils like eucalyptus or peppermint. Use a tongue scraper: It is not a good idea to brush your tongue. This will just move the bacteria around. Instead, use a metal or copper tongue scraper after meals and before bed. You can find them at most health food stores. Probiotics: Although there is not yet supportive scientific evidence, a high-potency probiotic is thought to prevent the bacteria buildup that causes bad breath and tonsil stones. Drink more water: You can prevent tonsil stones from forming by increasing your water intake. This will keep you hydrated and your mouth moisturized. Avoid mucus-forming foods: Mucus-forming dairy products should also be cut from the diet. Other mucus-forming foods include chocolate, refined flour, bananas, and processed foods in general. They promote calcium and mucus accumulation, which can lead to tonsil stones. Avoid high sugar foods: It’s a good idea to avoid foods high in refined sugar as well as sugary drinks that contribute to the development of tonsil stones. “Tonsil Stones (Tonsilloliths),” WebMD web site; http://www.webmd.com/oral-health/guide/tonsil-stones-tonsilloliths-treatment-and-prevention, last accessed February 11, 2016. Balch, J., et al., Prescription for Natural Cures: A Self-Care Guide for Treating Health Problems with Natural Remedies Including Diet, Nutrition, Supplements, and Other Holistic Methods (Hoboken: John Wiley & Sons, Inc., 2004), 82–85. “Tonsil Stones,” Breath MD web site; http://www.breathmd.com/tonsil-stones.php, last accessed February 11, 2016. York Morris, S., “Tonsil Stones: Symptoms, Treatment and More,” Healthline web site, January 7, 2015; http://www.healthline.com/health/dental-and-oral-health/tonsil-stones#1, last accessed February 11, 2016. “The Best Tonsil Stone Removal Methods for Removing Tonsil Stones,” TonsilStoneRemoval.org; http://tonsilstoneremoval.org/, last accessed February 11, 2016. “13 natural home remedies for tonsil stones removal,” VKOOL website; http://vkool.com/home-remedies-for-tonsil-stones/, last accessed February 11, 2016.